Night is Short, Walk on Girl | Anime etc. Have you seen the series The Tatami Galaxy? If you have, then this film is Tatami Galaxy: The Movie, from the same maverick director, Masaaki Yuasa. It’s a new story, but extremely similar in presentation, humour and madcap, leftfield fun. But it’s not as groundbreaking, of course, and it’s a few notches less good than Galaxy and Yuasa’s other anime greats (Mind Game, Ping Pong). Night is Short is an oddball, often random-seeming story that invites you to label it a shaggy dog. Technically, it’s not – the film makes a nominal point, but it’s not really the point. A boy and girl have a set of funny, fantastical adventures in Kyoto during an endless night, made for travellers who prefer silly journeys to sensible destinations. The comedy-fantasy suggests Pratchett, Python (one oft-repeated “dance” in the film could be a Monty Python Silly Walk) and a loonier, ‘toonier Durarara!! The design has slabs of bright colour, blandly iconic-looking leads and much livelier supporting characters. One evil(ish) student dictator commands what seem to be the monkeys from Wizard of Oz minus wings. The main characters are just mouthpieces for ideas and agendas. That’s often true in anime films (think of Your Name) but Night is Short is particularly naked. It doesn’t even give its lead characters names; they’re just “Sempai” – the boy – and “Girl with Black Hair.” Yet the film’s most touching when it animates human experiences. The girl envisages a second-hand book fair as a glorious ocean. The boy pictures his own mind as a chaotic debating chamber of yelling figures. For a film that initially seems shapeless, Night is Short is pretty orderly. It’s a four-part story, one adventure starting straight after another. This mostly works okay, but there’s a terrible sag at the end of the third “part” – involving a crazy travelling theatre and a musical climax – which should have really concluded the film. The story continues, but it feels like it hit a wall. True, there’s a splendid final dream spectacle, plus a discernable moral about how people’s search for magic miracles obscures the real, everyday ones that tie us together. It’s an adequate ending, though nothing stirring. 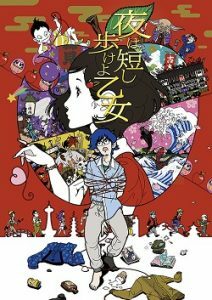 And many viewers may find even the enjoyable journey compromised, thanks to an issue that the film shares with Tatami Galaxy. It has very fast, lengthy dialogue, which means there are fast, lengthy subtitles to read, though you can often sense when the words are skippable without losing the plot.